Meet Bozo. Unlike his name may imply, Bozo is anything but clownish or silly. He is serious, kindhearted, and a very mellow dude. 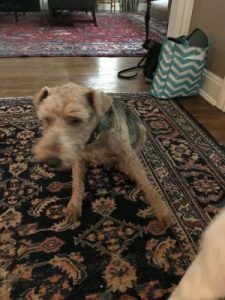 Bozo is a welsh terrier that has struggled with allergies his entire life. He is on a strict diet and supplement regimen to help with that, however, when he started to really struggle with limping and getting around the house, his mom was referred to us. Upon first meeting Bozo one could tell he was just tired and uncomfortable. His joints were stiff and he was moving so slowly. Every step seemed to be labored and his energy levels were nonexistent. Bozo’s spine and joints were in definite need of some tender loving care, which is where we came in! It took about four adjustments, and Bozo would show slight improvement with each visit. After his fifth visit, however, Bozo turned the corner and was like his old self again. This fifteen year old was not limping, his itching had decreased dramatically, and he was actually being very playful. He wanted to run a little bit and would saunter off and try to play with his brother, Freckles. There’s no doubt that Bozo is still a senior dog with mobility issues, however, for the time being his quality of life has improved drastically and we are excited that he is able to live out his senior years with more joy than he had previously!